Welcome To This 900 Sq Ft Furnished Mobile Home Located In Leeshore Estates On Midland Point Rd. 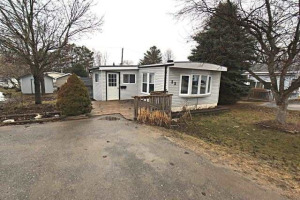 This 2 Bedroom Mobile Is On A Nicely Landscaped Lot With A Detached Garage. (One Of A Very Few Mobile Homes In This Park To Have A Garage) Enjoy The Private Beach In This Adult Community. Pride Of Ownership Is Evident In Leeshore Estates. Monthly Lease Fee Of $468.76 Includes Land Taxes, Land Lease And Water. Inclusions: Existing Fridge, Stove, Dishwasher,Washer And Dryer Plus All Furniture. Exclusions: Pictures On Dining Room And Bedroom Walls, 3 Matching Lamps In Living Room Plus Personal Belongings.